Hello, darlings get ready for a burst of spring. Are yo looking forward to "Spring Ahead" daylight savings time? 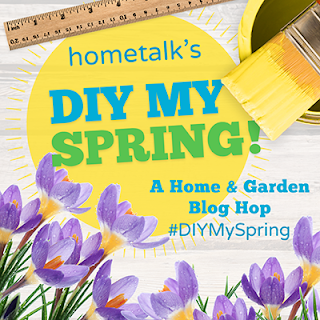 For weeks, Hometalks DIY My Spring Home & Garden Blog Hop bloggers have been preparing the best of their spring home and garden projects to share with you. I refreshed a lantern I purchased at a steal. 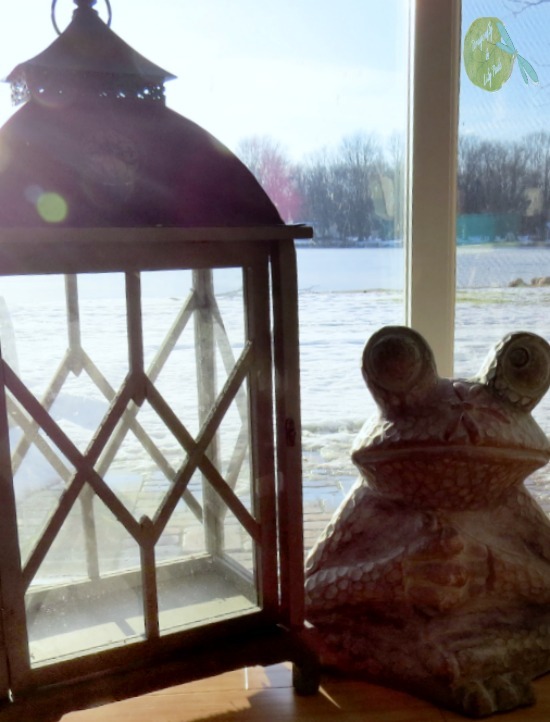 There are long shadows when it is late in the day in any home but, at the lake, my zen frog reassures me I need to take the time to enjoy the view. The green was brushed with a combination of half & half white and antique white paint. Prince Charming and I had to make a run to +The Home Depot, +Jo-Ann Fabrics and, Michaels Stores. 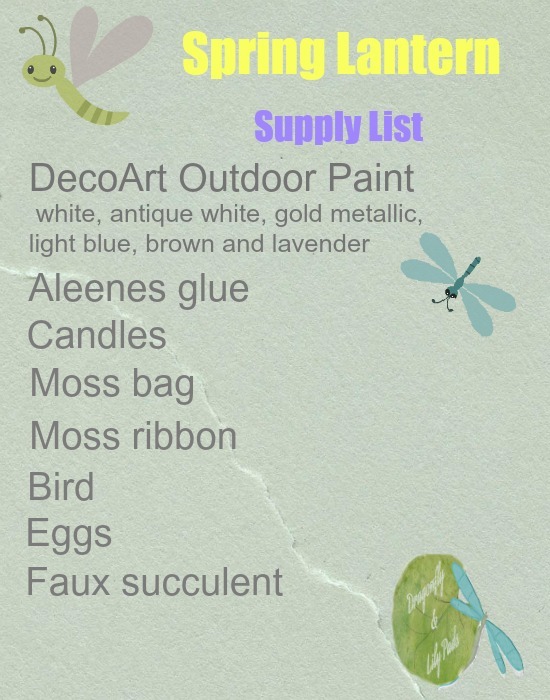 I will include a list below of what I purchased. While we were out shopping we spotted a much smaller lantern at a cost of $39.99. Here is where we insert me dancing!!!!! My lantern from +Goodwill which is over 2-foot tall cost $4.99. I know! Can you believe the deal? I can hear the aaaahhhhhs! I suggest a dry run with arrangements before gluing any components into place. It is easy to be creative before getting the glue out. Once the glue is used you are stuck with your choice. Opps! The glass broke but, on the positive side, it made the painting and styling much easier. I was able to buy replacement glass in the custom framing area at +Michaels Stores. 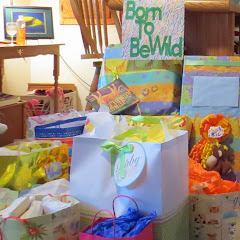 The blue tarp came in handy for this project from the Energy and Water Inspired Room Refresh. I am in love with the metallic gold paint especially on this metal top and latch. 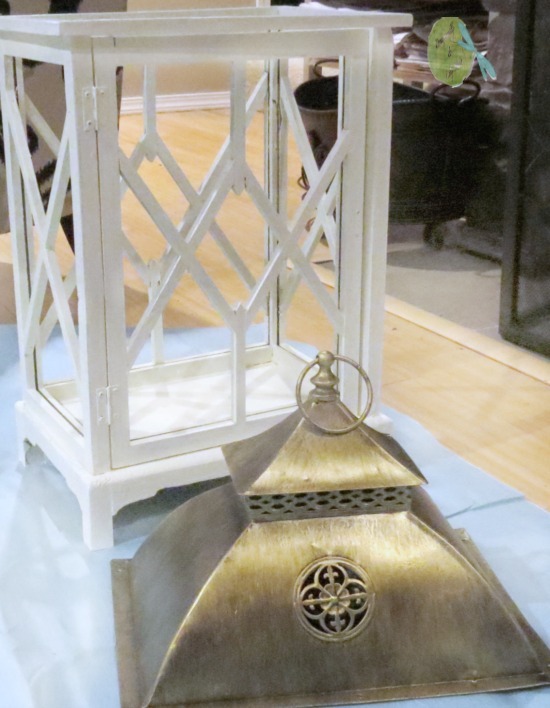 As you can see from the picture above the paint brush marks look awesome with the sparkle and shadows on the top of the lantern. 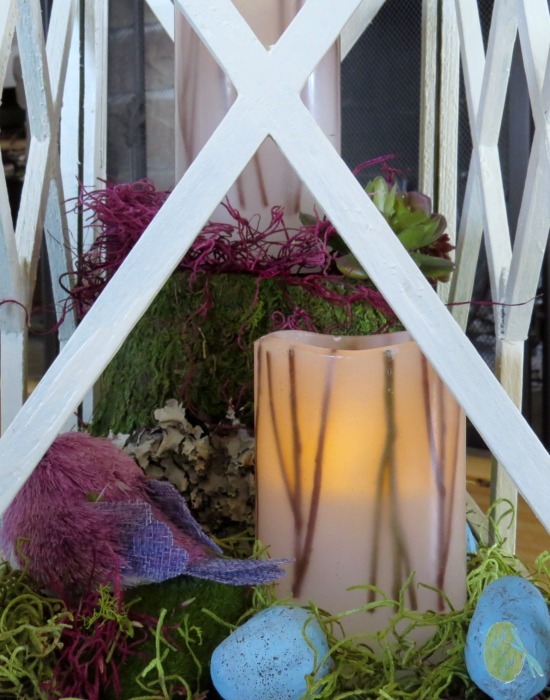 Painting paper eggs with layers of light blue, lavender and brown speckles give this lantern a pop of color. Even this sweet white tea light did not escape my golden paintbrush. I just love the soft glow. 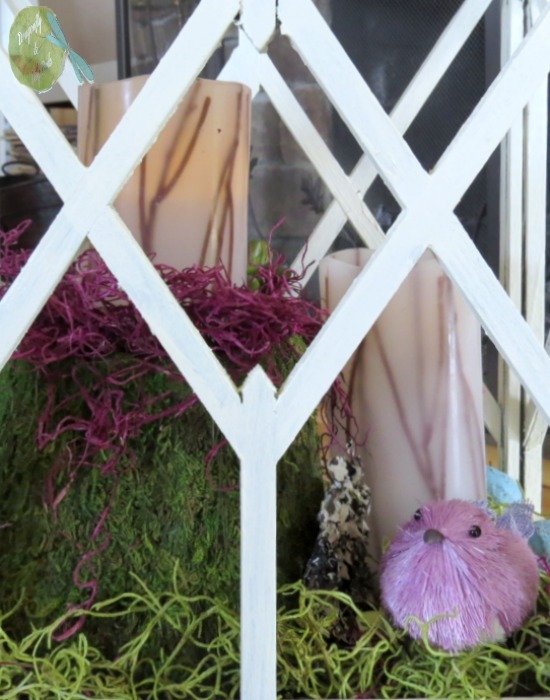 Taking time to enjoy the view now includes the flickering of the soft candle light in this spring lantern. I write posts on Hometalk too. 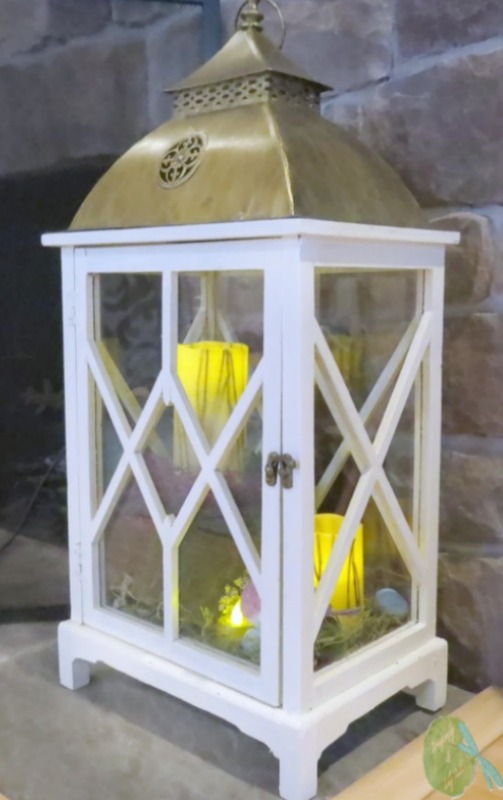 Here is a link to Spring Lantern. 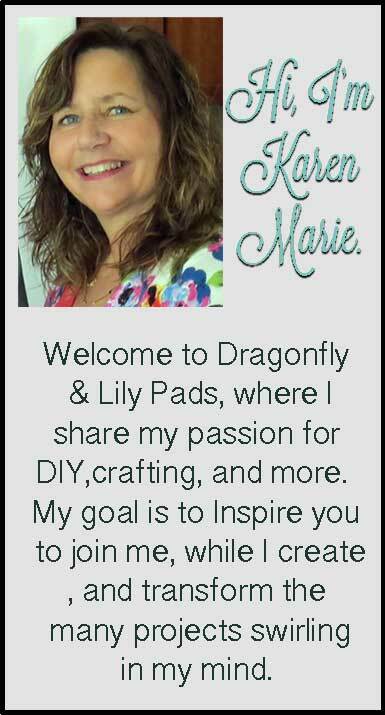 While you are there check out several more projects I have written about. It is a great place to be inspired, educated and ask questions about your home. Connecting with you is fun for both of us. Please follow me on the Social Media below. Let the fun keep blooming! 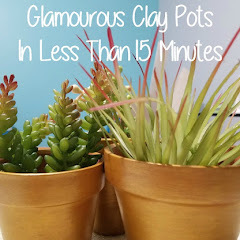 Such a great spring decoration! Love it! 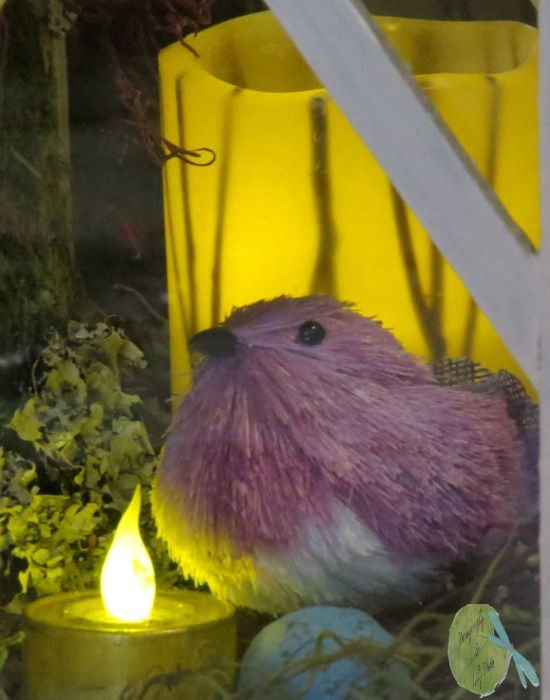 Karen, You nailed it with a Spring feel in your lantern. Thanks for the project list. I can't wait to create my own, too. This turned out beautifully! I love the succulent in it! Oh this is charming! Love all the little details- never would have thought to paint a candle gold! Now this was a treasure to find! I love your update and the special touches you added. It really looks lovely and delightful. 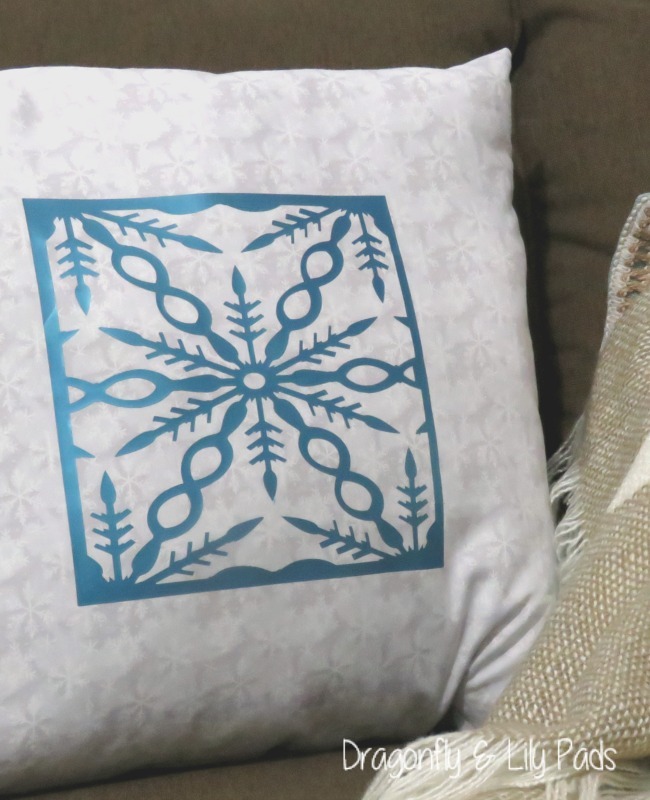 Thank for the inspiration because it really is a wonderful DIY Karen! How wonderful! I have to do this. I am always just putting plain old candles in my lanterns, but this is more like a cloche or terrarium. I love yours!! Very pretty!!! I'm always on the hunt for a lantern like this at the Goodwill, but haven't found one yet!! Now I know what to do with one! 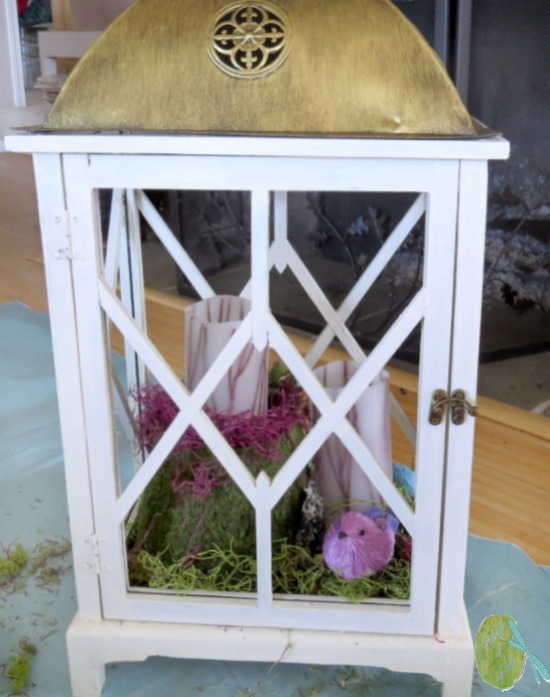 This is a very pretty arrangement inside your lovely lantern. And very original as well. All ready for Spring. I don't know how I missed your pretty lantern Karen but better late than never, I'm seeing it now. Can't beat that price - I'd have been doing the happy dance too. 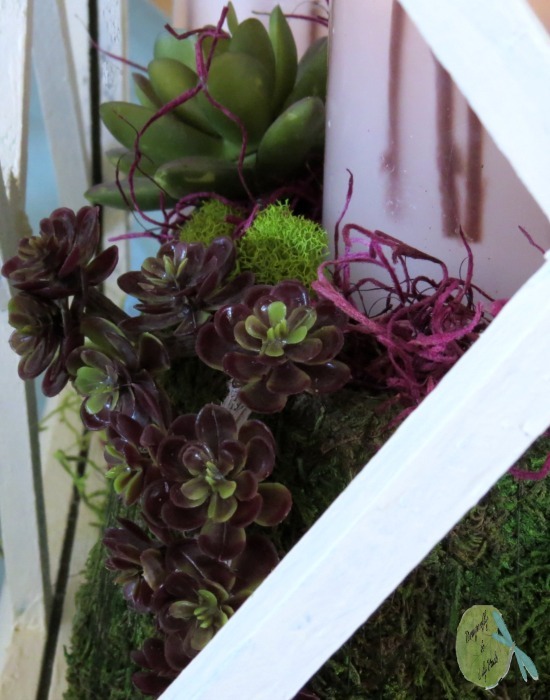 I love the way you styled yours for Spring - more like a terrarium. Very pretty! P.S. How lucky to be living right on a lake. You scored on this lantern! I love how bright and pretty it looks! Great job!